As published in StoreCheck Magazine on March 20, 2013, an interview by Erik Verdonck. How do you get youngsters interested in your shop? How do you bring the carefully prepared brand experience to the shelf? StoreCheck asked Joeri Van den Bergh. For years now Joeri has been researching the lifestyle of youngsters (aged 17 to 32), who are also referred to as Generation Y. His findings are gathered in his bestselling book How Cool Brands Stay Hot. A striking characteristic of this generation is that they are very critical towards advertising. Youngsters deal differently with media and marketing. So what gets them going and how do you connect these ‘smart shoppers’ to your brand or label? Generation Y is a generation of ‘adrenaline junkies’. They have seen it all, done it all. They are addicted to apps and social media. They are not stubborn, but they are loyal to their own opinion. Their friends are their main advisors and role models. Next in line come their parents and celebrities. Brands play an important part in their lives and are often talked about. Which values appeal to them? Happiness, authenticity and honesty, although the opinions on the subject tend to differ. It is clear, however, that happiness and joy are the main and most valued emotions. Honesty is a must. Reason is that these ‘digital natives’ are used to comparing everything. Those who are not transparent get “punished”. Authenticity is gaining in importance. This implies staying close to one’s DNA and being consistent. Smart shopping is good for your status. How do you get to that? We notice that discounters are ‘cool’ in all markets: it is ‘bon ton’, for example, to compose your own outfit. People are no longer ashamed about buying at a discounter. Price matters a great deal. And one is rapidly prepared to change brands or labels if something is available elsewhere for less money. This is destroying customer loyalty. Nonetheless some discounters manage to keep customers interested. In the USA, Trader Joe’s has an ‘every-day low price’ strategy and is therefore not putting any energy in promotions. Next to the price-conscious customers, there are those who want something which is more exclusive. The organic chain Whole Foods Market (US) aims at health but is also more expensive. The formula appeals to the more conscious and the better-off consumers. Youngsters attach a lot of importance to convenience (available range, long opening times) and proximity. That is why they are often prepared to pay more in a night shop. Another striking discovery is the rise of online formulas such as Delhaize Direct (BE). Nothing is easier than ordering online and picking it up at the shop. Tesco Home Plus (UK) takes it one step further: if you are going on holiday, you can order your groceries via a screen at Gatwick airport (London) before you leave. When your return home, you can immediately fill your fridge. ‘Smart shopping’ also implies avoiding long queues by ordering online beforehand. Self-scanning is not really an alternative, because you are effectively doing the cashier’s job. Which shops are popular with youngsters? What is the success factor? C olruyt (BE) is successful because the retailer is sticking to their own DNA. They have a green image because of their investments in a windmill park, the money saved on the paint for the car parks etc. This is not an ‘aspirational’ story but rather an incredibly strong concept. Furthermore Colruyt is very consistent. 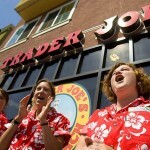 The American Trader Joe now has 365 shops in 25 states. The formula is managed by Theo Albrecht (Aldi). Their product range is limited to 4,000 references. However the discounter does surprise by offering products from all over the world, 80% of which is offered under their own brand. That is how people live an experience. Their staff wears a Hawaiian shirt and the atmosphere is very relaxed. Whole Foods Market (US) looks like an indoor market. The service is very personal, and this generosity leads to results. The same thing happens here, when, for example, Delhaize organises a ‘clean-up’ and removes litter in the area around their shops. Such actions are highly appreciated. Which recent ‘success stories’ could food retailers be inspired by? Skittles is launching fruit-flavoured sweets in all the colours of the rainbow. They post one or several funny one-liners on Facebook on a daily basis. On YouTube you can interact with their videos by adding your thumb to them. They have huge numbers of fans. The Norwegian dairy brand Litago tried to connect with students. They now co-create the flavours and their turnover has gone up by 200%. 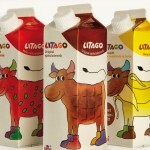 Litago is now the third most popular drink among Norwegian youngsters, after Coca-Cola and Diet Coke. There is an online game where you can try and influence cows to move to the section of your choice. That is how you influence the flavour. In Australia you can get personalised cans of Coca-Cola through the ‘Share a coke’ action, which is comparable with the Vedett bottle labels which you could have personalised. That is how brands reinforce the emotional connection with the client. A retailer such as Whole Foods Market becomes more than just a market. You can also go for local assets. Youngsters are proud of their roots. They will in the first place identify themselves with the place they live in, then with their place of birth; their country only comes third.